First and foremost I would like to extend my heartfelt thanks to Ate Jagif for giving me this award. I want you to know that I truly appreciate it. You're friendship will be treasure in me forever. More power to you and your hubby. I would like to give this 5 star award to Yumz, Marlet, Sweetpie, Ness, and Pinay Wahm. 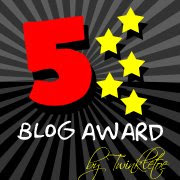 Girls please grab this award your blogs deserved to received this. Thanks!